All about Flour – What is a Grain? The outer fibrous layer is the bran, the small embryo from which a new plant grows is the germ and the bulk of the grain is the endosperm which is the starch used to create white flour. Wholegrain or wholemeal flours uses the bran, germ and endosperm. Bran – the outer fibrous layer contains some protein, fat and minerals. Germ – the embryo from which a new plant grows, contains most of the oils, some protein and the highest concentration of vitamins and minerals. Endosperm – inner white starch used to create white flour. Wheat is the most common grain used for creating flour and baker’s flour should be used to make bread because of its higher protein content. A protein level of 12-14% is required for high-quality bread. Spelt is very closely related to wheat and has a distinctive nutty flavour. It requires less fertiliser than wheat. Some people with wheat sensitivities can tolerate it. Khorasan or Kamut is also a wheat species but is more easily digested than wheat and some people with wheat sensitivities can tolerate it. It has a higher protein level than wheat with a nutty flavour. Currently most flour originates from many varieties of wheat and growing areas. These grains are blended by the miller to create a uniform product. Single Origin, however, is all about knowing where the wheat is grown and how the farmer treats his soil, crop and community. It is about understanding the grain varieties which influence the flavour, aroma and texture of the bread. Combined with the uniqueness of the sourdough endemic biological polyculture, flour is transformed into a bread with real nutritional character and unique flavour. Australia’s best high protein wheat comes from the “golden triangle” bounded by the towns of Narrabri, Moree and Inverell in Northern NSW and also from the Darling Downs in southern QLD. These areas have highly fertile volcanic soils, a temperate climate and abundant water supply both from inland rivers and the Great Artesian Basin. The farmers who supply Provenance Flour use a combination of techniques such as minimising soil disruption, minimising traffic on the soil, planting green manure crops, resting the soil, crop rotation and adding compost on a broad scale. Each spadeful of soil from their fields is alive with earthworms and the healthy crops are more able to withstand invasion from pests, minimising pesticide use. 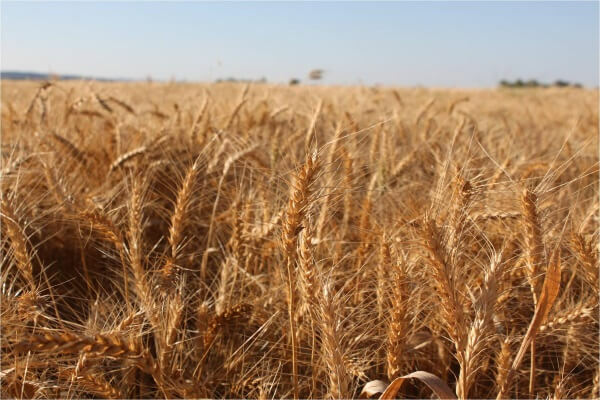 The focus of wheat produced for the commodity market has been high yield and disease resistance. However Provenance Flour’s farmers aim to create a unique flour which is the culmination of the soil, climate and grain variety from a specific farmer in a specific geographical region. We are fortunate to be able to offer Single Origin Provence Flour through this website. How is the Wheat Milled? Large-scale manufactures use high speed rollers to strip the grain into its three parts, the bran, germ and endosperm. The rollers are much faster and the heat generated causes the fat from the germ to oxidize destroying many of the vitamins, particularly fat soluble ones such as vitamin E. This loss of essential nutrients requires manufacturers to then add some back artificially. In Australia fortification of baker’s flour is required by law. This video does a good job explaining the current process for making commercial flour. Stoneground flour is created using millstones to ground the wheat. The process is slower and prevents the grain from being exposed to high temperatures allowing more of the nutrients to be retained. The endosperm, bran and germ are in their natural, original proportions, allowing for higher and efficient nutrient absorption. Here is a great video on the process of dressing a millstone. Whole rye kernels are usually referred to as “rye berries.” Rye growing in the field has an inedible hull, which must be removed before milling or eating. In rye, the starchy endosperm constitutes about 80-85% of the whole kernel, the germ 2-3% and the outer bran layers about 10-15%. 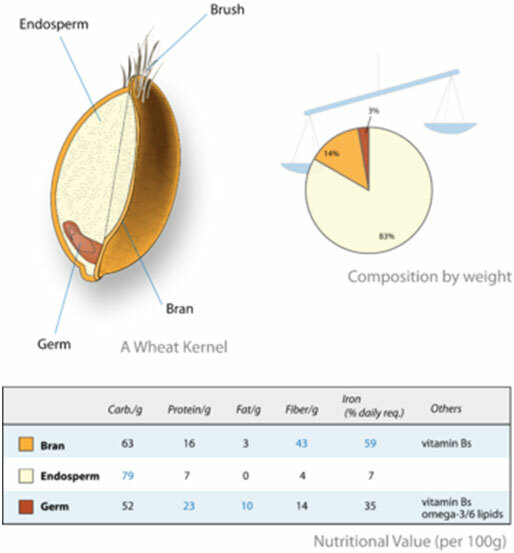 While the fibre in most grains is concentrated almost solely in the bran layers, some of rye’s fibre is also in the endosperm. Rye Flour contains only the endosperm. As with refined wheat flour it is missing many of the original nutrients in the rye kernel. Rye Meal contains the bran, germ and endosperm of the rye kernel and can be ground fine, medium or coarse. Rye has an amazing taste and is extremely good for you. In our experience people with gluten sensitivities can handle rye flour and rye meal although technically small amounts of gluten exist. In our process a very small amount of diastatic malt is used. This is a natural product made from sprouted grain or barley which is dried and ground. Diastatic malt is used to help convert the starch found in flour to sugars that are usable by the yeast over an extended ferment. It is used by many Artisan Bakers in Europe, US, and Australia. Normally diastatic malt is applied at 0.1% of flour weight. That is 1 gram or a pinch for 1kg flour. This post goes into more detail on Diastatic Malt. Diastatic malt can be obtained from Brewer Stores or occasionally Health Stores or we recommend this online supplier. An ideal would be to use filtered water but if you don’t have it don’t worry the bread is still great with normal tap water. Sea salt without iodine is best but if you don’t have that then normal salt will do just fine. If you want to create a Mixed Grain Sourdough you can purchase grain mixes such as the ones available from this online supplier. If you want to create a Mixed Seed Sourdough you can purchase grain mixes such as the ones available from this online supplier.